Braces – which consist of brackets attached to the teeth with dental adhesive and flexible wires which are held into the braces with coloured or clear plastic modules – work by gently applying pressure to the teeth to gradually move them into the correct position. In some cases, orthodontic elastics (sometimes known as rubber bands) are used to apply additional pressure in a specific direction to move individual teeth or groups of teeth and are commonly used to improve your bite. Orthodontic elastics may also be used with clear aligner treatment such as Invisalign®, especially when complex tooth movements are required or if bite adjustments are needed. Customised for each patient, the rubber bands typically stretch over tiny hooks on the top and bottom brackets of your braces or over small clear buttons attached to a few teeth if you are wearing clear aligners (Invisalign®). If worn consistently and every day, these tiny elastics will apply the steady pressure needed to guide teeth into the correct position. These elastics are usually crafted from medical-grade latex, which is safe to be in contact with your mouth, but latex free options are also available – and no, they are not normal elastic bands or hair bands! 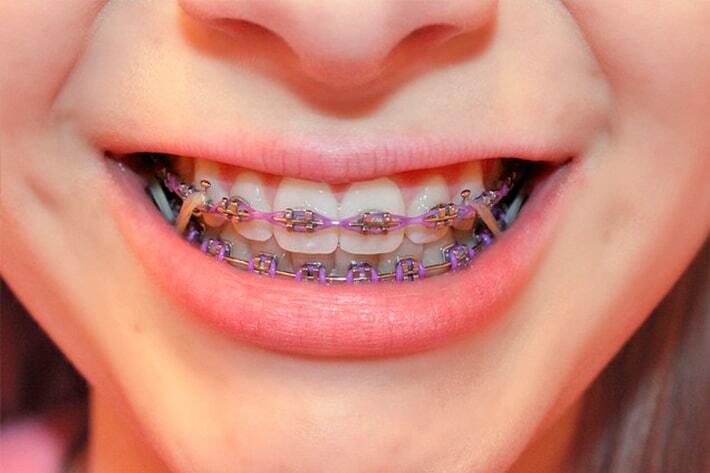 Your orthodontist will demonstrate how to wear the elastics so it will soon become second nature to replace them. There has been a worrying trend in recent years for people attempting to fix their smile at home with household items, such as dental floss or hair elastics. This is incredibly dangerous and may damage the teeth and gums, often resulting in infections or tooth loss. It is very important that you don’t take it upon yourself to force changes to your teeth without your orthodontist’s advice – such as by adding elastics when they’re not required or by doubling up on them to try to make the changes occur faster – as this can cause damage to the roots of the teeth and can even result in tooth loss. DO – Get in the habit of carrying around extra elastics and replace them as soon as possible if one breaks or is lost. By consistently wearing the elastics you will ensure that your orthodontic treatment is always progressing. DON’T – Double up on elastics (unless specified by the orthodontist) as this may cause too much pressure on the tooth or teeth and can actually harm the roots of the tooth. DO – Always wash your hands before removing or replacing the elastics. DO – Call your orthodontist if you run out of rubber bands. Your orthodontist will normally provide you with plenty of elastics to keep you stocked up and will happily provide you with more if needed. Make note of the type of elastics you are wearing (they have different names and sizes on the packet) so you know what to ask for if you run out. Elastics are a key part of orthodontic treatment and learning how to remove and replace them is an important part of the process for most patients undergoing braces or Invisalign® treatment. Before your orthodontist sets you on your journey to a perfect smile, they will make sure you understand all there is to know about this aspect of your treatment as the need for elastic wear will vary greatly from one person to another. How will elastics affect the cost of braces? Since rubber elastics for braces are quite small, easily available and cheaply made they won’t have a massive effect on the overall cost of your orthodontic treatment. Whether you will need to use braces to assist with some tooth movements will be assessed prior to commencing your treatment, which allows your orthodontist to ensure you’re fitted with the right brackets from the start. You’ll be provided with additional elastics on the day of your appointment, to allow you to change your elastics as needed or if they break. However, it is crucial that you follow your orthodontist’s advice when wearing elastics as improper use, such as doubling up on your rubber bands or attempting to use them on different teeth, can lead to damage that can be costly to fix down the track. If you are confident in your family dentist you can ask them to refer you to their preferred local orthodontist so that you can rest assured that they’ll be able to work collaboratively to ensure the ongoing health of your teeth. Alternatively, you can use our online tool to help you find a registered specialist orthodontist in your area. All of the ASO members displayed in the individual directory have completed their specialist orthodontist training and are registered with the Australian Health Practitioners Regulation Agency (AHPRA), so you can be confident in their ability to offer a high level of orthodontic care. I’m planning to get my braces done but my orthodontist told me I only need my top one done although I need to pull two teeth down how is this going to work?